Shadowboy lost his first two teeth over the weekend,* and instead of eagerly surrendering them to the Tooth Fairy he was adamant that he wanted to keep them. 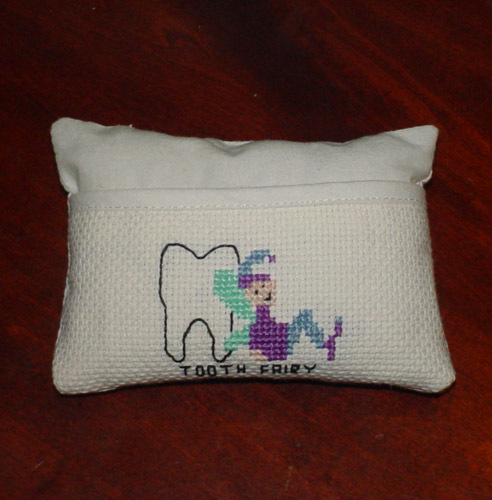 ** This threw me a minor curve, since I’d made a tooth fairy sachet to facilitate the tooth-to-money conversion (it’s way easier to find that under a pillow than it is to go groping around for a single tooth), and I hadn’t expected a tooth-based mutiny. We compromised by putting the tooth under his pillow but leaving a polite note asking the fairy not to collect it. *** In retrospect, however, we should have just filed an official Tooth Loss Certificate with the Central Bureau of Fairies. Notion Farm has a cute kit that is precisely that: A pretty letterpress form with tooth loss details and embossed seal, plus a silk-screened “deposit bag.” It’s $16 for the starter kit, and extra certificates are $5 (apparently official fairy policy only requires one tooth to be kept on file, but some families like to be particularly diligent and deposit additional teeth). I like the Notion Farm kit, but if it doesn’t suit your tastes it wouldn’t be too hard to DIY something more to your liking. An “official form” isn’t difficult to create–I did a mockup just for fun, and it took me about 15 minutes–and you can customize it to include whatever information you want (it’d be entertaining to do one that required reams of information, from blood type to grandmother’s maiden name). You could decorate the “deposit bag” with embroidery or fabric paint, or eschew the bag in favor of an official-looking manila envelope or file folder. This is much more fun than just jamming a naked tooth under a pillow, so if you know a child who’s shedding teeth this would be a great project. **It’s possible he thinks the Tooth Fairy dabbles in voodoo. ***She even wrote back! Her handwriting is surprisingly similar to Santa Claus and the Easter Bunny’s, so apparently all mythical beings use the same stenographer.